Spanish influence on Filipino cuisine is still evident despite strong american influence. 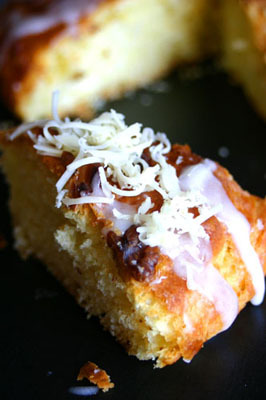 Ensaymada is one of those afternoon bread we love to eat that we inherited from the Spaniards. This is originally a Majorcan brioche, a giant rolled brioche that’s totally filipinized to our palate. With butter, sugar and grated cheese on the top, perfect for any miryenda. Start first by putting one cup of flour in a big salad bowl and add your warm milk. Put the the yeast and salt. Try to put the salt as far as possible from the yeast. Mix well this mixture and add your egg and sugar. Continue mixing, pour on the top another one cup of flour and let this stand for about an hour. We want the yeast to ferment. You will notice later that the flour you put on the top seems to crack that’s the indication that the yeast have already started fermenting. Add the rest of the flour (but be sure to do it little by little try to leave about half a cup), add your butter cut in small cubes. If you have a kneading machine or a bread machine you can use them to help you handle the dough. The dough will be very sticky at this point. You will have to add the butter and eggs at the same time little by little. Be sure that the butter is cold so it wont stick too much. Add more flour if needed. Knead this dough for about ten minutes. Put some oil on your salad bowl and put back this sticky dough cover it with floured towel and put this in the fridge. The next day, get your dough and try to knead it again. Cut your dough in 8 equal portions. Roll each portion into a small rounded band and make your ensaymade. If you want you can just make a giant ensaymada. You need to put directly on the top of your parchment paper your ensaymada. Brush it with egg white and let it stand for another two to three hours before baking. Preheat the oven at 200° celsius. This would depend on a lot of ovens, bake your bread for about twenty minutes. Before serving brush the top with margarine, sprinkle with sugar and some grated cheese.